How to Start a Business in Taiwan is an elaborate and informative guidebook that includes everything a foreigner needs to know to start a successful business in Taiwan from the value of being an entrepreneur, to renting or buying an office; from marketing in Taiwan, to getting government grants; from the business registration process, to working with accountants and lawyers. 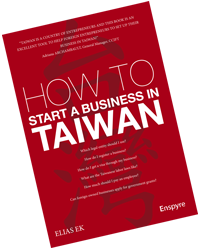 How to Start a Business in Taiwan also includes many insider start-up tips and suggestions, coming from foreign entrepreneurs who have already built their own businesses in Taiwan and other countries. In short, How to Start a Business in Taiwan is a must-have if you are interested in or thinking about setting up a business in Taiwan. And if How to Start a Business in Taiwan doesn’t cover something you think it should cover, contact us now. Best of luck with your endeavors!